Share the post "Optimizing Soil Health in New Jersey"
Soil test kits are available through Rutgers Cooperative Extension county offices. While spring yard work involves preparation for summer vegetable gardens or rejuvenating lawns, at the top of your to-do list should be soil testing–after all, your landscape and garden crops are grounded in soil, relying on proper soil conditions for availability of most nutrients. Soil nutrients are derived from both mineral breakdown (weathering) and organic matter decomposition. Nitrogen, phosphorus, potassium, calcium, and magnesium are nutrients needed in relatively high amounts and are called macronutrients. Other elements from soil are needed in trace amounts, but are still essential to the life cycle of most plants–such as iron, manganese, copper, zinc, and boron. It is important that these nutrients be available in the proper balance for optimum production and health of the plants. A deficiency of any one may cause reduced growth or yield, deformities or undesirable characteristics (poor quality), or even susceptibility to disease and other stresses. Understanding the nutrient availability of soil is one reason why soil testing is an important “Best Management Practice.” With this knowledge, you can make sound decisions about what deficiencies need treatment and what excesses can be avoided. The treatment decisions usually relate to what fertilizer amendments to purchase and apply. Economically, it makes most sense to invest in a fertilizer which corrects deficiencies but prevents over-application of any nutrient. The agronomic and economic principles apply to soil pH as well: many plants have a specific optimum pH range which affects their growth/production directly as well as indirectly, affecting solubility (availability) of the soil nutrients. Many plants prefer “slightly acidic” soil pH (6.3 – 6.8), but others may perform better at pH below 6.0 (acid-loving plants) and others at pH at 7.0 or above (neutral to alkaline pH). How do you know if you need limestone to raise soil pH this year? Is it possible that you’re applying limestone too frequently? Do you need to acidify the soil instead? A soil test will inform you so you can make management decisions for best results and financial considerations. We must also be conscious of potential impacts of our soil management decisions on the environment. Nitrogen applied in excess of what crops need, or otherwise applied carelessly, can pollute groundwater and other water bodies. In estuaries and bays, nitrogen can lead to eutrophication (excess algal growth, high oxygen demand, and toxic effects to aquatic life). Likewise, erosion of phosphorus-rich soil into freshwater lakes, streams and rivers can have a similar result. Eutrophication not only degrades water quality and harms natural aquatic ecosystems, but it also affects the beauty and recreational uses of these valuable resources. Avoiding fertilization altogether may be your strategy, thinking that plants will grow as they will. But keep in mind that in many manipulated suburban environments, thin layers of previously eroded and/or compacted soil may not be at a desirable equilibrium with the requirements of vegetation, which often includes non-native plants. Establishing a new balanced condition may take years, but can occur with well-timed and gauged applications of specific soil amendments. Creating a full cover over the soil surface (and dense rooting within the soil) will help to preserve the soil and enhance its health in the long term. So, put soil testing at the top of your spring to-do list. 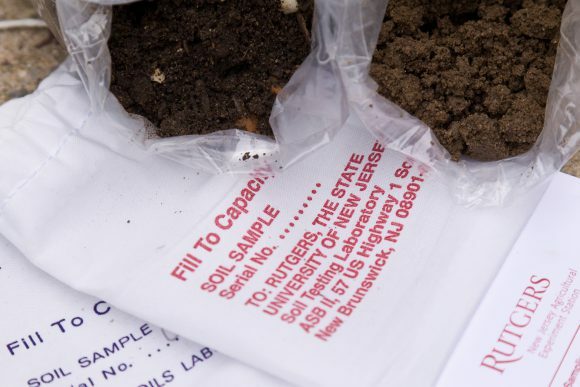 Rutgers Soil Testing Laboratory processes over 8000 samples each year; the basic fertility test includes soil pH, nine nutrient levels, and recommendations for liming or acidifying, and fertilizing for the sample area. Soil testing kits (prepaid soil fertility analysis) may be purchased at most Rutgers Cooperative Extension county offices. Kits include sampling instructions, a soil test questionnaire, and a mailing bag/envelope for the sample and questionnaire. Alternatively, instructions can be viewed online and questionnaires downloaded; send sample to the Soil Testing Lab along with the completed questionnaire and payment. Please follow sampling instructions carefully. The analytical results and recommendations are only as good as the sample represents the desired area. As instructions describe, the sample should be made up of multiple subsamples obtained randomly throughout a specific area (one crop with same treatment history) and homogenized to represent that soil zone. Recommendations cannot be provided for more than two plant/management situations. Fill out the soil test questionnaire completely (and legibly). Test results will be emailed or mailed. While the target turnaround time for soil fertility analysis at Rutgers Soil Testing Lab is about one week, the heavy sample load in the spring often creates a backlog and slows response time. For timely results, take and send your soil samples early.